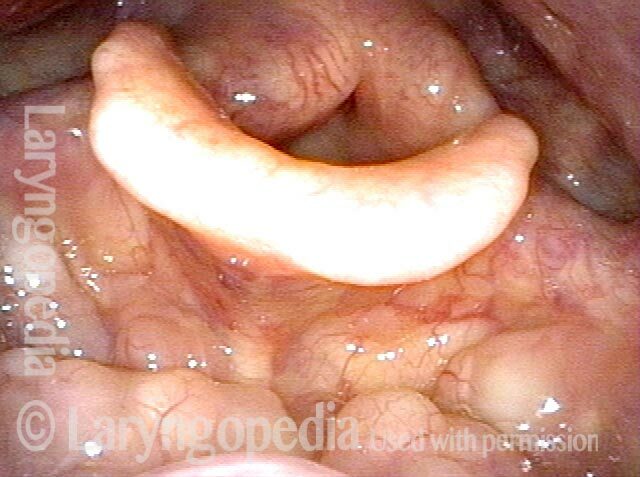 A vallecular cyst is a mucus-containing cyst in the vallecula. Such cysts are relatively common. 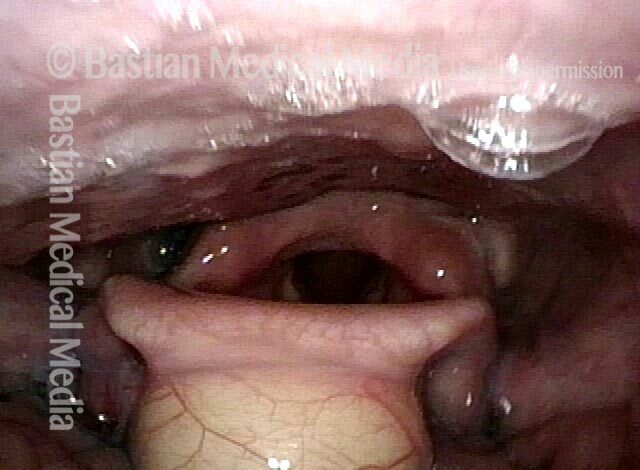 Vallecular cysts are almost always asymptomatic and found during examination for another issue, such as a voice problem. 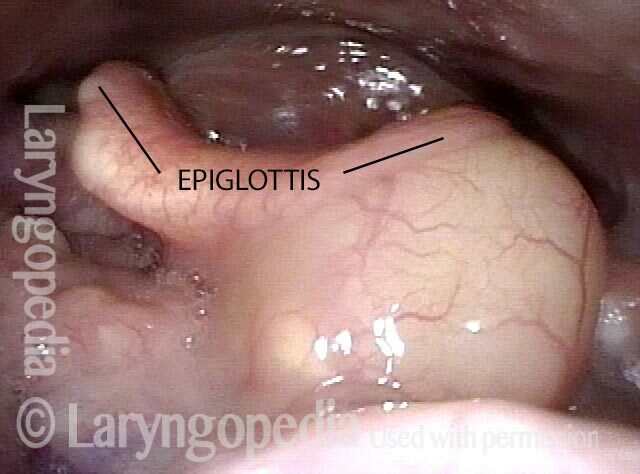 Panoramic view of the laryngopharynx, showing two vallecular cysts (arrows), between the base of the tongue and epiglottis. Closer view. These cysts were an incidental finding during an examination for an unrelated complaint. They were not causing the patient any problems and could be left alone. Enormous vallecular cyst in this young woman. Swallowing of solids is affected. Food seems to catch and then expectorate back up to the mouth. No problem with liquids. Palate, pharynx, and larynx function are all normal. There is no pooling of saliva in the hypopharynx. An organized ring of applesauce remains after trying to swallow blue-stained applesauce. Water wash is very effective in clearing the applesauce away. Vallecular cysts are usually left alone; here, the plan is to remove it with the thulium laser and see if swallowing is restored. A large vallecular cyst in an older man with awareness of a “foreign body” sensation when swallowing. As a swallow begins, note the posterior pressure on the epiglottis and lateral pressure on the pharyngeal wall. Normally we leave these alone, but with careful discussion he wanted to be rid of this to see if it would diminish his symptoms. With the patient sitting in a chair under only topical anesthesia, office laser coagulation begins with a wide area. Coagulation now involves the full thickness of the cyst wall. When it sloughs off, the cyst will be widely unroofed. Cyst contents are spilling out. At the conclusion of the procedure the cyst has evacuated its contents and collapsed in size. The coagulated surface will detach over the next week or two. The collapsed cyst with nearby unrelated and typical vallecular cyst requiring no treatment.